These Baked Korean Chicken Wings are sweet and spicy and full of flavor! Perfect appetizer for football season! Preheat oven to 425 degrees. 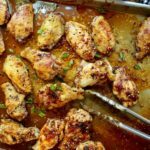 On a large baking sheet spread the chicken wings out on a single layer. Drizzle with olive oil, and sprinkle with salt and pepper. Toss to coat thoroughly. Bake in the oven for 15 minutes. Remove from oven. Brush the chicken wings with 1/3 of the Ahssa Sweet & Tangy sauce, 1/3 with the Korean Hot & Spicy sauce, and 1/3 with the Korean BBQ sauce. Broil the chicken wings for 7 minutes until nicely browned. Check for doneness and remove from oven. Garnish chicken wings with chopped scallions and toasted sesame seeds. Serve warm. Ahssa Gourmet Sauces can be purchased here, or in the links above.